My own feelings about fellow Texan and former President Lyndon B. Johnson have evolved and become quite a bit more complicated over time. After starting with very negative opinion, I've generally become more admiring and sympathetic, and more appreciative of his great qualities that so highlighted the depth of his tragic flaws. And you cannot be a well-informed Texan without understanding how his legacy has profoundly affected, and indeed still affects, this state. But as I've read more biographies and other books that have added to my knowledge of him, I've also became more and more of a fan of his wife — born Claudia Alta Taylor, but universally known as "Lady Bird" since long before she married. My admiration for her is unmixed with the negatives that must color my views of her husband. She passed away, peacefully, today at her home in Austin at age 94. I don't think it's sexist or demeaning to recognize that one may be ennobled by what one undergoes and contributes on behalf of a spouse. And as a spouse, as in all other respects, LBJ was, to put it mildly, a challenge and a handful. Most of the country, probably including their own two husbands, saw Lady Bird as a dull sparrow compared to swanlike, glamorous Jackie Kennedy. But that's a very shallow view, and in more meaningful terms than glamor — in terms of service, direct and particularly indirect, to one's country and civilization — Mrs. Johnson comes off the superior of the two with the perspective of time. "I was once asked to describe her in one phrase," Harry Middleton, former director of the LBJ Library and Museum, said in a 1995 interview about Mrs. Johnson. "And the phrase I came up with was 'grace and steel.'" 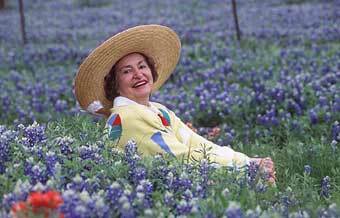 And I'll also steal and reprint here the Statesman's photograph, which resonates for any Texan who knows her story and has ever reveled in a springtime hike or drive among the roadside bluebonnets and other wildflowers. I share your admiration of Lady Bird. She was always grace. The more I've learned about Mr. LBJ the more I dislike him and the following of sycophants, lackeys and toddies. Rest in Peace, Lady Bird. I'd put that on a billboard, if I could. As First Lady and after she and LBJ left office, Lady Bird was compared to Jackie Kennedy and always came off the loser. She was mercilessly criticized for her appearance and especially for her focus on conservation, wildflowers, and highway beautification - because these were considered trashy compared to Jackie's more elegant and sophisticated concerns. The passage of time shows that Lady Bird was the true visionary, as anyone who drives through the Texas Hill Country each Spring knows. The link didn't work but I found it at your website. It's a lovely picture. Thanks for posting it.